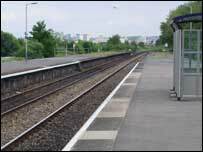 Police in Bristol have named a 12-year-old boy who was killed on a railway line near Bedminster station on Thursday, 23 September. David Hagin, from Bedminster, suffered fatal injuries when he was struck by a passenger train travelling from Penzance to Bristol. It is not yet known how he came to be on the track at the time. A police spokesman said David was a pupil at Ashton Park secondary school in Bristol. He said: "The investigation is still under way but is almost complete. "At this stage we still believe it was a tragic accident. We are not treating the death as suspicious." David's headteacher, Chris Gardner, paid tribute to the year eight pupil. "David was a very quiet, gentle boy and he kept himself to himself much of the time. "It was a complete shock. His parents are devastated and were totally inconsolable."